Scheduling Systems - Aspenhills Consulting, Inc.
New collaborative design tools and procedures, 4D modeling, real-time reporting systems, the increased trend toward prefabrication, and material/resource tracking systems all require a dramatically different approach to scheduling. Today's advanced design and construction environment enables a project team to move from the old SD/DD/CD segmented design sequence to a more fluid, interactive process that is much more efficient during both design and construction. However, the fast moving interaction between numerous design elements working in real-time and in parallel requires an equally responsive scheduling process to provide proactive controls rather than reactive, after the fact reporting tools. A scheduling charette conducted early in the design phase is essential to reaching an understanding and agreement on scheduling tools and practices that will be employed throughout the entire process. The charette will also set the initial framework for all of the design and construction milestones. Team members need to agree to the numerous deliverables; how the information will be collected, analyzed and reported; their responsibilities for interaction with other team members; how changes and issues will be addressed; and to gain an appreciation for how valuable the scheduling information can be as a proactive management tool. Initial programming, design and construction schedules must address milestone deadlines that are essential to overall project management. But the ability to create meaningful control points that are no longer as simple as SD/DD/CD stages of documents and the need to control the very fluid design environment between these points necessitates a more responsive, real-time scheduling process. An interactive scheduling system can now enable design teams to work in parallel and keep all parties working efficiently. Our personnel can either work with the designer's and contractor's team by assisting them in implementing these advanced scheduling techniques and reviewing their deliverables, or by subcontracting the entire scope of work. The 4D process ties the schedule to the 3D model and helps all team members better visualize and plan the flow of construction activities, site logistics, and construction staging. Our personnel can work with managers of the design and construction team to optimize the entire sequence. We can visually help facilitate the interaction between design milestones and construction activities so that information is delivered at the right time and in the right sequence. The 4D model is also a useful tool for presentations to owners, financial institutions, and public agencies. Materials are being delivered to both the jobsite as well as remote assembly areas. To a larger degree, the subcontractor who is performing the prefabrication may now be controlling the materials and labor sequence of numerous other trades. This information then needs to be integrated back to the overall master schedule. The use of major prefabricated components now limits the ability of the field supervisors to shift labor to other jobsite areas when delays occur. The efficiency that is gained through off-site assembly in a controlled environment can easily be lost if preceding work sequence is delayed. Material and resource tracking capabilities now expand the event horizon for the construction process. The ability to accurately track purchasing of materials, fabrication at remote factories, and shipping schedules can now reduce surprises that would have otherwise only come to light when materials were late for delivery to the jobsite. The live integration of material tracking systems with the scheduling system can provide additional time for managers to accommodate problems rather than having to react at the last moment. Construction delays,inefficient labor usage, impacts on hoisting schedules, and accelerated transportation costs can be minimized through advanced information and the time to plan. Our experienced team can operate in this new environment to bring projects the control and accountability necessary to gain full value. Rather than working simply as a reporting tool, our scheduling process works to bring greater efficiency to all of the project team and thereby reduce costs, decrease the construction schedule, and enhance quality. Working either with the design/construction team or outside equipment/FF&E designers, buyers, installers and the owner's facility management department, our personnel can help schedule purchases and deliveries as well as integrate this process back into the overall design and construction schedule. 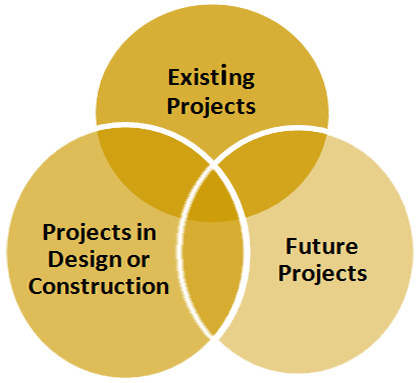 We recognize that some projects are part of an entire program. The lifecycle of a project most likely has an effect on other projects in the program. By looking at projects as integrated business fractions rather than individual projects, our schedulers can consistently and methodically define, coordinate, standardize, and manage the lifecycle of multiple projects in a program all at once. Our ability to provide a Project Dashboard reporting system that presents live updates of the schedule in an easily understood format also enables all of the team's managers to keep appraised of the project status. Rather than having to individually review and interpret complex schedules, or spend the time in group meetings to be informed of schedule information, managers can now stay informed through a web enabled device anywhere in the world where there is internet access. The dashboard will even provide a summary of important schedule activities and report a status of behind/on/or ahead of established dates. We can assist your firm in the selection, implementation, and training of software and scheduling systems to support the advanced design and construction processes in your company. Our personnel have experience with scheduling requirements for public and private projects including hospitals/medical facilities, manufacturing/industrial, military, energy/power, utilities, site infrastructure, education, retail, office buildings, mountain resorts & condominiums, high-rise construction, hotels, and correctional. The best thing about proper planning is the ability to glimpse into the future. Thinking through a project from idea to reality is the best way to manage your risks and assess situations when they arise.